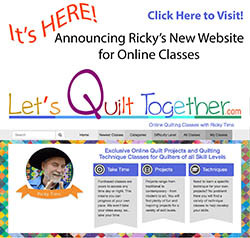 Join Ricky for the inaugural opening of his newest online class at LetsQuiltTogether.com. Registration is open now. Class starts Saturday, March 26, 2016! 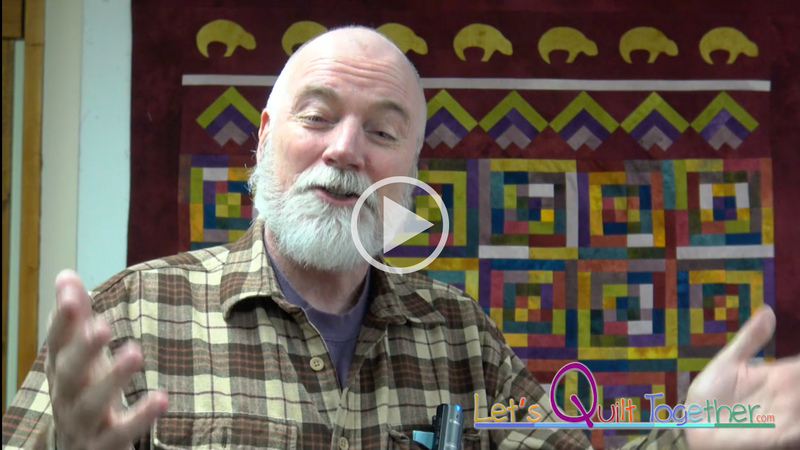 If you have never taken one of Ricky's online quilt classes, this is a great time to start. 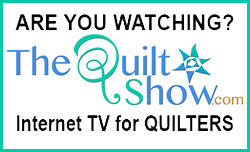 The class runs for a short three weeks and the quilt is quick, easy, and fun. Mi Cabina, By Ricky Tims, 70.5" x 80.5"
Mi Cabina (a twin/queen-bed coverlet) is the perfect snuggle quilt for you, but it also makes a great graduation gift or housewarming present. It features a fun variation on a timeless classic - The Log Cabin Courthouse Steps. The design has a scrappy aspect that is unified by a formal design layout. 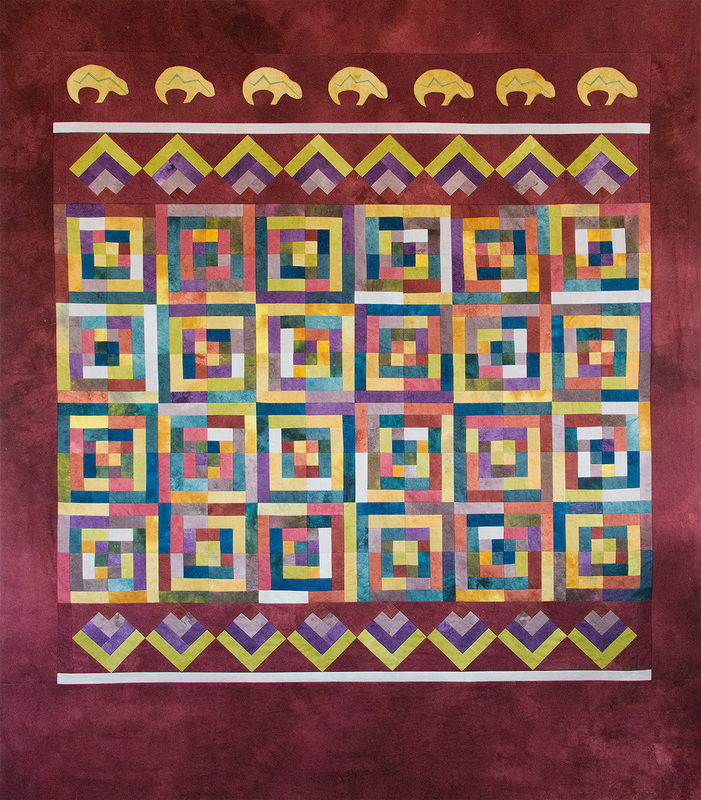 The appliqués featured in the border can be personalized allowing you the option of truly making this quilt your own. The classes post each Saturday morning and the best part is that you can participate at your own pace in the comfort of your own studio. You will be making the quilt along with other online classmates which means you can interact with them and share photos of your progress! Click on the image to view the video trailer. 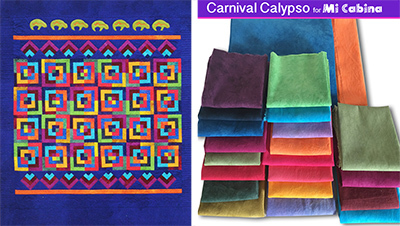 Pick from your stash or order Ricky's hand-dyed fabrics today and get them in time for class. 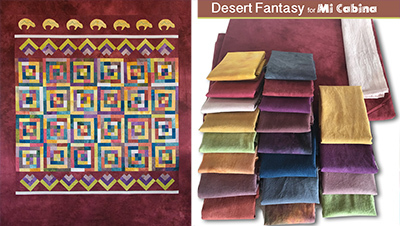 The fabric kit is available in two beautiful color ways - Desert Fantasy and Carnival Calypso. It contains all the fabric needed to make the quilt top and binding. The kit includes over 8 yards of fabric along with the original Mi Cabina pattern from JWD Publishing. 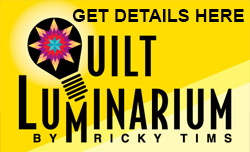 For those wanting to use Ricky’s hand-dyed fabrics, act now! Only 32 kits in each color way are being produced for the inaugural opening of the Mi Cabina Class. Ricky Tims' 100% cotton hand-dyed fabrics have a unique suede-like visual texture with a lovely soft hand. They are approximately 44" wide. The fabrics are individually hand-dyed in the USA at the Ricky Tims dye studios. Kits will begin shipping around March 15. I've been on a quilt vacation bc of moving and my whole sewing room in boxes in garage. THEN we didn't move!! So this is a great stimulus to get myself unpacked, put my knitting needles away, find my stash & get to it!! Thanks Ricky! I needed that! !